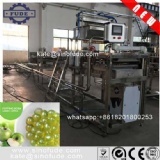 CBZ100 Popping boba production line is developed by FUDE MACHINERY and we are the only factory that can manufacture this kind of machine in China till now. It adopt PLC control system and with fully automatic design. 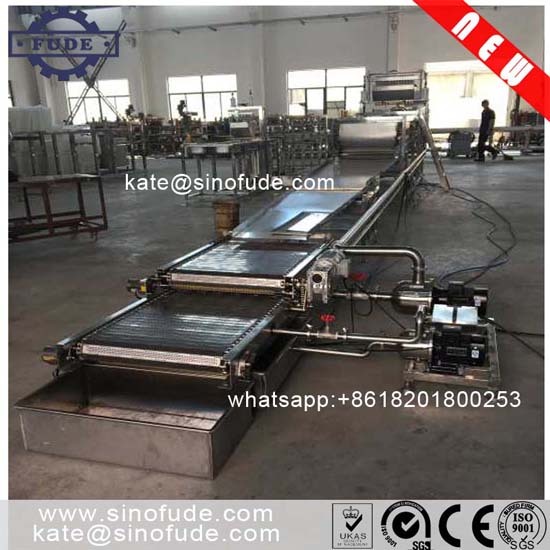 The whole machine is made of stainless steel and it is fully comply with the food sanitation standards. 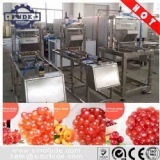 The popping boba that made by this machine is in beautiful shape and filling can be any taste, bright color and weight is without any variation. Popping boba is made with jam inside and the outer coating material can be recycled using. The whole set of machines include the jam hopper, SUS pans, flushing system and cleaning system and etc.. All these are made of stainless steel and can be used safely and meet the sanitation standards. The popping boba can be used in bubble tea, ice cream, cake decoration and egg tart filling, and etc. It is new developed and healthy products which can be used in many food products items. 5. Temperature and humidity: <25C, 45~55% humidity.